This three-span crossing is the first major bridge to have been built entirely to Telford's design. It is made of red sandstone quarried locally, at Nesscliffe, and the cost of construction was £6,000. The central arch measures 58ft across and rises to a height of 24ft above mean water level. The two outer spans are each 50ft wide. The roadway as built was 20ft wide. 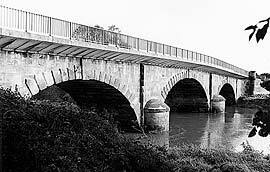 In 1963 it was widened by adding 2ft and 4ft 6in-wide footpaths, using a cantilevered, reinforced concrete slab extending 5ft 6in on either side of the original bridge. Montford Bridge's true significance, though, lies less in its construction that in the team that built it. Telford employed his friend and colleague, Matthew Davidson of Langholm, to superintend construction, and a mason from Shrewsbury called John Simpson. The three men continued to work together throughout their lives.